Does Frozen Yogurt Contain Live Cultures Like L. Acidophilus? If you are looking for a cool and refreshing dessert, frozen yogurt is a healthy option. If you have digestive problems, you may be wondering if frozen yogurt contains the same active and live cultures, particularly L. acidophilus, as ordinary refrigerated yogurt. Frozen yogurt is a fermented dairy product containing live cultures within a whole, nonfat, low fat or skim milk base. During the yogurt-making process, manufacturers inoculate the dairy base with two live cultures -- Lactobacillus bulgaricus and Streptococcus thermophilis -- which kick starts the fermentation process. According to Tufts University's "Tufts Journal," manufacturers often add additional cultures such as L. acidophilus and Bifidobacteria to improve the probiotic benefits of the yogurt. A flash freezing process then converts the yogurt to frozen yogurt. 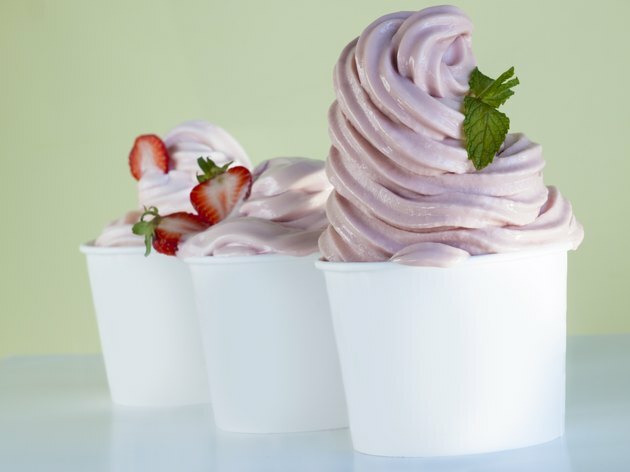 Frozen yogurt is just as healthy as refrigerated yogurt. In fact, the University of Michigan Health System explains that the probiotics within yogurt are able to survive the freezing process without altering the health benefits. Lactobacillus bulgaricus and Streptococcus thermophilis as well as any added live cultures such as L. acidophilus enter a dormant state during freezing, returning to an active state when they come in contact with body heat after ingestion. The manufacture of frozen yogurt is not subject to the same federal regulations as traditional refrigerated yogurt. Tufts University's "Tufts Journal" explains that the National Yogurt Association sets the standards for frozen yogurt. The National Yogurt Association sponsors a volunteer labeling program for frozen yogurt products, requiring frozen yogurt manufacturers to supply a minimum of 10 million live culture cells for every 1 gram of frozen product at the time of manufacture in order to receive the sponsor seal. Always check frozen yogurt products for The National Yogurt Association's seal if you prefer to eat frozen yogurt that contains probiotics such as L. acidophilus. By adding acidifiers to turn the dairy base to yogurt before freezing, some manufacturers bypass the fermentation process required for approval by The National Yogurt Association. Oklahoma State University Extension explains that some yogurts undergo heat-treatment, which kills any living cultures that it contains before flash freezing. Tufts Journal; Is Frozen Yogurt as Nutritious as Regular Yogurt?